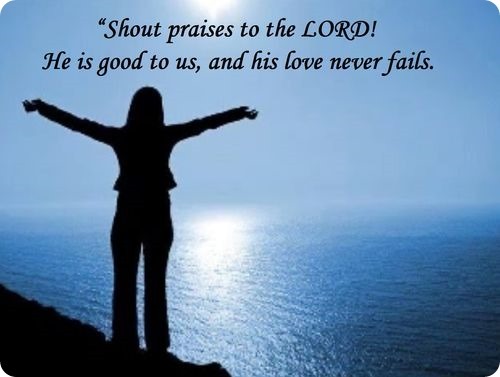 The call of every day is to… “Shout praises to the Lord! He is good to us, and his love never fails. Everyone the Lord has rescued from trouble should praise him, everyone he has brought from the east and the west, the north and the south. Some of you were lost in the scorching desert, far from a town. You were hungry and thirsty and about to give up. You were in serious trouble, but you prayed to the Lord, and he rescued you.” (Psalm 107:1–6, CEV) That’s not only the Psalmist’s story it’s also mine and we’re sticking to it! Have you ever begun a prayer with something like this, “Okay God, where do I start?” It’s not that there’s nothing to pray about. It’s not that there’s nothing to praise God about. It’s about all the things facing you and you don’t know which one to begin with. It’s about all the times when God has rescued you and you can’t determine which one stands out in your memory the most. While that may not apply to you it does me, and not just once in awhile but nearly every day. To be honest there are times when answering that one question is more difficult to answer than the praying. Last night as I watched our great grandson Colton going about being a nine month old baby boy somehow I was able to turn the calendar back and I saw myself as a nine month old baby boy completely dependent on those around me. Colton can feed himself, but someone needs to prepare his food and put it in front of him. And like Colton over the past 67 years I’ve made many messes of myself, and like Colton who couldn’t clean himself up great grandma came to the rescue and cleaned him up I too need someone to help me clean up my messes in my case it wasn’t my great grandma it was God who cleans me up through Jesus. Colton depends on someone else to dress him, I depend on God to dress me with the Holy Spirit. In some ways I will always be a nine month old baby boy because I will always be dependent on God, and I will always be dependent on those around me. To know and realize that truthfulness I don’t have to turn the calendar back 67 years all I need is to turn it back to September 17, 2013 when I laid in a hospital ICU following heart bypass surgery. I usually don’t do this but I want to dedicate this morning’s Glory Seed to my grandson, Colton’s dad. Sometimes the hardest part of giving God the praise he so richly deserves is to do so from the, “scorching desert, hungry and thirsty, far from a town and about to give up.” I know I’ve been there many times!